Growing up in a small town in Italy, Guido di Pietro was interested in two things. He wanted to follow Christ’s example in all things and he wanted to develop his talent for painting. God showed him how these two things were his vocation. Our vocation is God’s call to share in Jesus’ life and work. 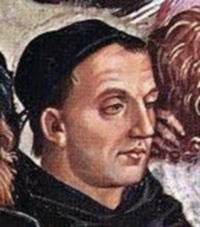 Guido was born in 1387, and when he was 18, he joined the Dominican order as a religious brother. Brothers are not priests. Religious brothers serve their community through prayer and work. It Italy, religious brothers are called “Fra.” Religious brothers are often given a new name. Guido’s religious name was “Fra Giovanni” or Brother John. His work in his community was painting beautiful religious art, initially for manuscripts, which at the time were each copied by hand. The moment the members of his religious community saw his beautiful paintings, they said that he “painted like an angel.” That is how he became known as “Fra Angelico.” Every day before he began to paint, Fra Angelico prayed that God would guide his hand and help him to create a painting that would inspire people to grow closer to God. 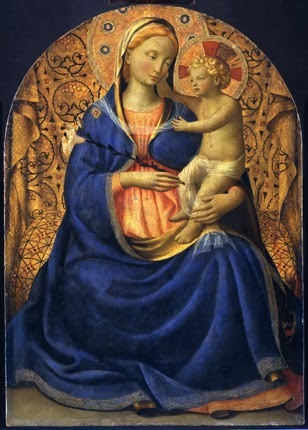 Fra Angelico became very famous. He painted holy figures and angels and was even called to Rome to paint portraits of the saints on the walls of the chapel of Pope Eugenius IV and then Pope Nicholas V. His work can be found in museums and churches and holy buildings throughout the world. He died in Rome in 1455 and was beatified in 1982 by Pope John Paul II. The pope declared him the patron saint of Catholic artists in 1984. We call Fra Angelico “Blessed.” His life helps us to understand that we are called to use the gifts we have been given to serve others and to give glory and praise to God. 29 1/8 x 24 in.